On August 17, 1977, Ohio State University astronomer Jerry Ehman was sitting at his kitchen table, pouring over pages of printouts from the SETI Project's Big Ear radio telescope's computers. On these pages were line after line of numbers and letters. A cluster of six characters jumped out at Ehman and he circled them in red ink. Next to that circle he wrote: "Wow!". 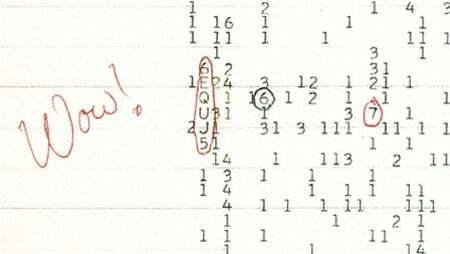 SETI stands for the Search for Extra Terrestrial Intelligence, and in the 34 years since Ehman's discovery astronomers have been agonizing over the precise meaning of what has become known as the "Wow! signal". It's non-terrestrial in origin, meaning it's not man-made and didn't originate from Earth. Wow! was traced back to a cluster of 100,000 densely packed stars in the Sagittarius constellation. But was this just a noisy star, or a signal sent from a distance race? And if this was first contact, why did the sender transmit just once? The mystery is made worse by the "what if" factor: what if Ehman had received the data sooner, or if modern computers were available to crunch the data? The data was three days old by the time Ehman spotted Wow!, meaning that if it were a message, the sender could have moved on for lack of a reply. Such a delay wasn't unusual: it was standard practice to distribute Big Ear printouts once a week. Meanwhile, the kinds of computers Ehman might rely on today were still in the future: Steve Wozniak had only just built the Apple I and II. The most computing power SETI had at the time was an already 12-year-old IBM 1130 – powerful for its time but with limited memory and no GUI input. SETI Institute's research director Jill Tarter, in a conversation with The Reg at SETICon in Santa Clara, California, last year, lamented the missed opportunity and the lack of computing power. "Back in 1977, the computers were just dumping numbers to paper readout that somebody collected every week," she told us. And this isn't the only time that computers have let us down. Not so long ago, in 2003, people got in a plasma storm over whether a signal branded SHGb02+14, identified by the SETI@home project, was a promising candidate sent from the depths of space. SETI@home is the effort sponsored by the University of California at Berkeley that runs in the spare cycles of a distributed network of three million volunteers' PCs, crunching radio-telescope data. "We had two signals that are unexplained because of the way they were gathered, and it was not possible to follow up on them," Tarter says of Wow! and SHGb02+14. Thirty-four years after Wow! the SETI Institute is getting serious. SETI has now finished a major overhaul of the hardware and software behind a massive expansion in research, taking the hunt for extra terrestrial intelligence through to 2020. SETI has installed its first-ever, off-the-self, Intel-based servers – from Dell – in the belief that commodity machines are finally powerful enough to processes in real time the huge quantities of data it receives from space. The data itself is being sucked down by a brand-new radio telescope array being built in northern California that was funded initially by Microsoft cofounder Paul Allen and called the Allen Telescope Array (ATA). In a major shift of research culture, SETI is also opening up to outsiders, making the ATA's data available to the public, and posting data on the cloud – Amazon's cloud, to be precise. It began releasing ATA data to setiquest.org in February 2010. Last month, SETI finished the job of open sourcing the code of its closed search program that runs on the Dell servers and that processes ATA's data. The next step is to invite coders outside of SETI to start building new search algorithms that could help its scientists find the next Wow!. "We couldn't have done this five years ago or a year ago," Tarter tells us. "We are finally at the point where commodity servers are fast enough where we can throw away the custom signal processing gear we built." Yes, you read that right: SETI had custom-built its own systems in order to process radio-telescope signals from space, believing it could do a far better job than the brains in Palo Alto or Round Rock. "Now, for the very first time, we can get the heck out of the cathedral," she tells us. "In the past [people outside SETI] couldn't help us because you needed to know the intricacies of the special-purpose hardware in order to develop code or do any work with us." Now you can.